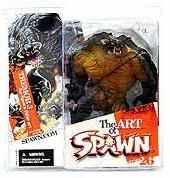 Description Of Item: This Figure is from the SpawnBible, a new re-modelled from the previous re-incarnation of Tremor. Except from Issue #25: Tremor, a new force on the street, arrives in Spawn's alley, looking to expand his turf. Spawn launches a preemptive attack, luring in Tremor with a decoy, then choking him with his chains. Tremor than reveals that his real foe is Twistelli. It turns out that Tremor had been a normal man who Twistelli transformed into a hulking brute, and now he's hell-bent for revenge.